TNS is a global market research consultancy which advises clients on specific growth strategies around new market entry, innovation, brand switching and stakeholder management, based on long-established expertise and market-leading solutions. TNS BBSS is the Bulgaria-based regional hub of a group of TNS companies in SEE, including Bulgaria, Romania, Serbia, Montenegro, Bosnia and Herzegovina, Kosovo, Albania, Macedonia and Moldova with partners in Slovenia and Croatia. media outlets among the continuing prophecies for the imminent death of traditional media. Such diversity poses a lot of challenges to brands in defining their customer segments efficiently, especially when they operate a big portfolio of products on different markets. In fact, such complexity offers the opportunity of targeted approach towards consumers in the era of increased digital personalisation, while the assumption that traditional digital platforms are ousted from daily media routine once digital comes into play is far from being the absolute truth. It is true, however, that there is a great degree of complexity in targeting the new type of connected consumer in a meaningful and effective way. Over the past five years, TNS has undertaken extensive research on media habits, device usage and online behaviour in just about every market and category on earth. We have revealed that attitudes towards digital activity and device usage are as important as the access to them. True understanding of the potential of the digital scene comes at the crossing point between access, usage and attitudes and gives marketers a powerful tool for understanding digital users’ behavior and digital markets potential. We were thus able to come up with a robust and globally comparable framework under the Connected Life methodology. We discovered two dimensions that differentiate connected consumers, and each of them has its own implications for how marketers reach them. The first dimension which we call “Digital influence” is the degree to which a consumer is connected throughout the day across multiple devices; usually it increases with improving internet access. Typically a higher degree of connectedness would result in higher consumption of online video, a greater engagement with eCommerce, more multi-screening and the use of multiple online touchpoints in the path to purchase. At the extreme, this also means a reduced consumption of traditional media. In short, this dimension measures the degree to which digital is influencing a connected consumer’s life. The second dimension – “Social Influence” – is the degree to which social (media) connection and content is important to a connected consumer. Do they feel the urge to check their Facebook status all day? Are they vocal online, or more voyeuristic? Are they likely to respond to branded content in social channels? And in mature economies, does social play a role in the purchase journey? Fundamentally, are they the type of person who embraces social media, warts and all? By knowing the answer to this question, you can determine whether a strategy led by social content is right for your target audience, or not. When we look at the two dimensions together, we end up with four different personas with core behavioural characteristics that are remarkably similar no matter which part of the world we are talking about. When it comes to digital lifestyle in Europe, the differentiating line goes from North-West to South-East. Users in NWE have a higher level of digital access but are less enthusiastic about it, while those in SEE are still catching up on the digital influence but maintain and aspire more active digital lives (chart 1). 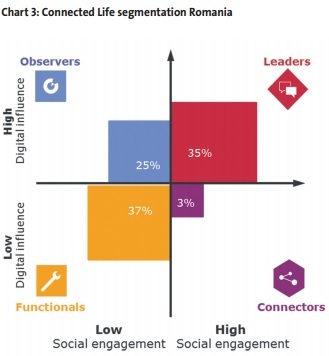 In order to reveal the specifics of digital markets in Bulgaria and Romania, we first need to define the four personas of connected consumers. Leaders are always set apart by their constant, energetic participation in the virtual world, their curiosity about technology and their heavy dependence on it. Leaders typically form 30% of the online population across markets. In some Central European countries their share reaches 40%. At the other end of the spectrum are Functionals, who typically form another 30% of the digital population in most markets. Functionals are slower, more cautious adopters of technology, often being nudged along either by the need to keep up with the world or a conscious awareness of tangible practical benefits. A measure of skepticism continues to flavour their interactions with the online world, and they are relatively reluctant online shoppers. Observers are highly curious about and enthused by technology, and take pride in knowing about the latest innovations. They are extremely comfortable around technology and enjoy being able to figure things out for themselves. They differ from Leaders by their lack of a similar enthusiasm for social media, so they are a niche group, whose adoption of digital media and devices has been driven by their interest in the functionality of technology rather than social engagement. Typically, Observers form around 10% to 20% of the online population. Connectors are the opposite of Observers, as their interaction with the online world is driven primarily by social media. They tend to form 15-20% of the online population in most markets. They are not especially interested in having the latest devices, provided the ones they have are good enough for accessing social media and connecting with friends and family. 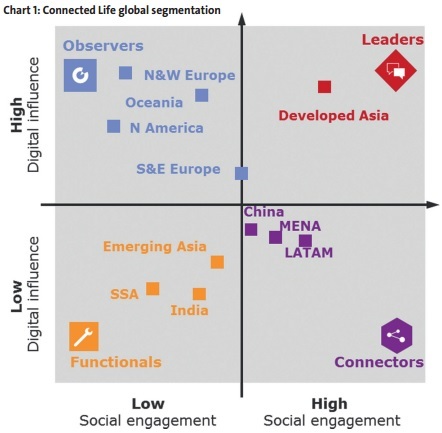 In SEE, Connectors form a lower portion of the digital population compared to the world average. In 2016 TNS BBSS revealed the segmentation of digital personas in Bulgaria and Romania by conducting quantitative surveys representative for the internet population in both countries, following the global TNS Connected Life methodology. The two countries showed interesting differences, compared to SEE markets and to each other. We might be tempted to assume that those digital consumers who belong to the Leaders segment are predominantly the youngest digital users. While this is the case for some markets, nuances exist. The demographic profile of the Leaders in Bulgaria suggests that the highest percentage of youngest consumers (18-24) indeed belongs to this segment, compared to the other three. However, their share of the segment is 24%, the same as the share of the 35-44 year olds, while one third of Leaders are in the 25-34 age bracket. Given the passion for the newest digital, which describes this segment, the relatively higher age group comes as no surprise as it also goes hand in hand with a certain level of affluence, also confirmed by the fact that Leaders have above average income and are predominantly urban residents (60%). The majority live in the capital city and a third in the big cities. The digital behavior of this segment is flavoured by intense usage of internet and social media. It is typical for Leaders to look for information online, to research brands and products, to browse forums for product reviews. They also consider social media as a reliable source of information. When it comes to brands, however, only a third of them are connected to a brand profile in social media. Still, this is the highest level of engagement compared to the other groups. As far as e-commerce is concerned, this is the segment most open to this way of purchasing. Close to a third of Bulgarian internet users claim to make online purchases often (26%), while among the Leaders, this percentage is 37%. However, even among the most digitally advanced there are 18% who are reluctant to purchase online. The main drawbacks are not too different from the concerns of the rest of the digital users: safety and quality concerns, need to see and touch the product before buying. Observers also have a very distinctive demographic profile. Unlike Leaders, who have an equal gender split, males have a slight prevalence in this segment. Most of Observers are 25-44 years old. This segment has a strictly urban profile with most of its representatives living in the big cities and falling into the average income ranges. As with Leaders, Internet plays an important role in their lives and they are actively researching products, reviews and posting comments but to a considerably lesser extent than Leaders. Observers are open to making online purchases, although less frequently than Leaders. While they share the same concerns regarding e-commerce, they exhibit an interesting characteristic more than any other segment – impatience – they do not want to wait for product delivery. Functionals on the other hand, are predominantly elder female (45-54) living in small towns and villages, with low income. They access the internet rather rarely and do not rely on it as a primary source of information. Although 60% of them have a Facebook profile, social media don’t play a significant role in their everyday lives. While the demographic profile of the segments corresponds to that of Bulgarian digital users, their digital behavior, even among the most digitally advanced, has a slightly different dynamics. Overall, Bulgarian online users maintain a more dynamic digital lifestyle compared to their Romanian counterparts. They access the Internet through more devices, spend more time online and in social media and see them as reliable source of information and entertainment. Bulgarians are also more active in online purchases: half of Romanian digital users have never purchased anything online, compared to 33% of Bulgarian ones. Romanian Leaders maintain a slightly lower level of overall digital and social enthusiasm as compared to their Bulgarian counterparts: 74% of Romanians in this segment claim to spend a lot of time online, compared to 83% of Bulgarians; 44% share opinions online, compared to 36% in Bulgaria, and only 35% believe they can trust information on social media versus 65% in Bulgaria. These specifics of attitudes and behavior will command a tailored approach to the Leader segment in each country despite the similarities in their overall characteristics. Digital and social behavior in the rest of the segments in both countries does not reveal significant differences. 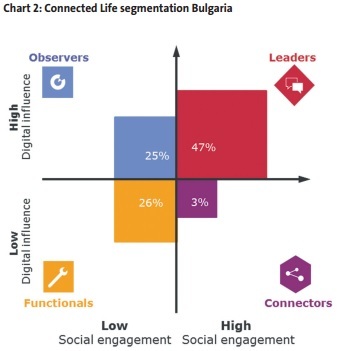 The segmentation of digital users in Bulgaria and Romania reveals markets with very diverse online population, resulting in online behavior patterns which vary by the mix of traditional and digital media, level of engagement with brands and social platforms and spread of digital activity across devices. Moreover, this mix varies across categories. Hence, these markets require tiered marketing approach tailored to the different personas and the mix of personas within each product and service category.